As we move into spring/summer there are any number of noticeable changes taking place. Living in the mountains I notice a shift in attention. I am less concerned about how much firewood is available for the stove and more concerned about fuel for brush fires. 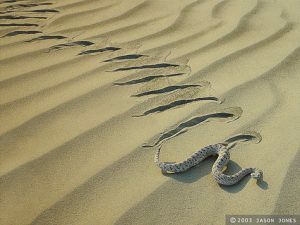 I see the tell tale patterns of snakes emerging from hibernation etched out on the sand of the hiking trails and I have to remember to watch where I step. We have several indigenous species here, venomous and non venomous, each with it’s own function in the eco system. After quite a few years living with these creatures as neighbors I have developed some admiration for their nature, and learned to be respectful of their ways. And with some, that extends to the understanding that I really pay extra attention and exercise caution. Not unlike the practice of meditation and the world of the thinking mind I might suggest. We live in a constantly changing relationship to the information and experiences available to us – whether we notice it or not. We can observe the trails of thought and sensory information and use that as a guide to what is important and to where we are now, or we can find ourselves oblivious to what is here. Lost with ideas or preoccupations that do not serve us now. Through mindfulness practice we foster the capacity to be more in touch with what is arising, spending less time on what has past or may never arise. And over time we can develop more skillful ways to relate to and use that information and awareness to anchor us in the moment for our benefit and the benefit of those around us. There is no time like the present to begin or renew your practice of mindfulness. And we have several programs beginning soon to support you on your journey. Check out our many up coming events here!